Ground Travel Specialist, also known as GTS, is a medium-sized motorcoach and charter bus rental company that specializes in taking care of groups that need transportation. We have completed over 15,000 charter trips with more than a million passengers in the past dozen or so years. We are safe, professional, and the best choice for your travel needs. 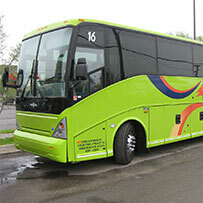 GTS isn’t just the safest and most reliable charter bus company in Detroit — we can help you plan a trip with our experienced tour department; we can aid you in the marketing of your event with our vehicle wraps; or we can just show up with amazing vehicles based on your pre-planned schedule. Whatever you need, call GTS for reliable, helpful, and knowledgeable service. 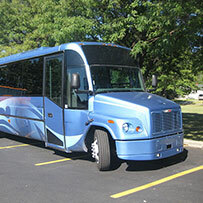 GTS has several styles of charter vehicles to choose from. Each comes with standard amenities while some have extras. No matter which vehicle you pick, we keep each one immaculately clean, sanitized, and meticulously maintained. 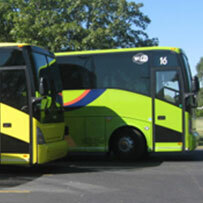 All vehicle pictures on our website are of buses and motorcoaches that are part of our fleet and not just stock photos. GTS hires only the most talented and safe drivers. We look for people with great driving records who know these vehicles and care about their passengers. We continually train and test our drivers to ensure that they are prepared and ready to handle whatever comes up. Drivers make the difference between good and great trips, and we are proud to say that our drivers are the greatest! William Cox worked as a dispatcher for another motorcoach company before joining the military. After returning from training at U.S. Marine Recruit Training Depot in Paris Island, SC, he found the company he had worked for had gone out of business. Armed with just enough money for a down payment on one vehicle, the experiences he learned from his previous employment, and a determination emboldened from his Marine training, he started his own motorcoach company — GTS. Over the years as the business grew, William made it a point to revamp and recondition his fleet in order to always provide the best buses that were in the best shape possible. In addition to keeping the Ground Travel Specialist charter buses in excellent condition, GTS trained all of their drivers in the latest customer service methods and safe driving procedures. Over time and thanks to the company’s dedication to perfection, GTS has become one of Michigan’s premier motorcoach companies. The reason for our success today is what has helped us be successful in the past — our vehicles are the most reliable, cleanest, are filled with the latest amenities and comfort features, and we always have safe, professional drivers for every trip. 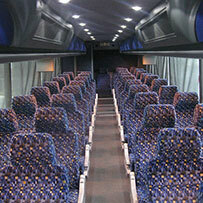 We have charter buses that fit your needs. We are a full-service charter bus rental company with our own fleet and friendly contacts with some of the other legal and responsible bus companies in the state. No job is too big or too small. We have great vehicles with the best amenities, including Wifi, electrical outlets, onboard restrooms, and DVD players and video systems with multiple monitors. Our professional staff will get you a fast quote specific to your group’s needs. You will always have a courteous and helpful driver that will pick you up on time and get you to your destination safe and sound. How do you know which company to choose? Look at the real fleet of vehicles the company has, ask about the hiring requirements and training of the drivers, and notice the difference in professionalism and knowledge from the caring office staff you deal with. After reviewing these three things, and getting fair and honest pricing, you too will choose GTS! Contact us today.